It’s six weeks into the season now and the sinking feeling is growing. Each time I’ve gone out I’ve thought, “Next week I’ll find them.” Then I wouldn’t. This weekend I made it out twice and both times were dismal in terms of birds. 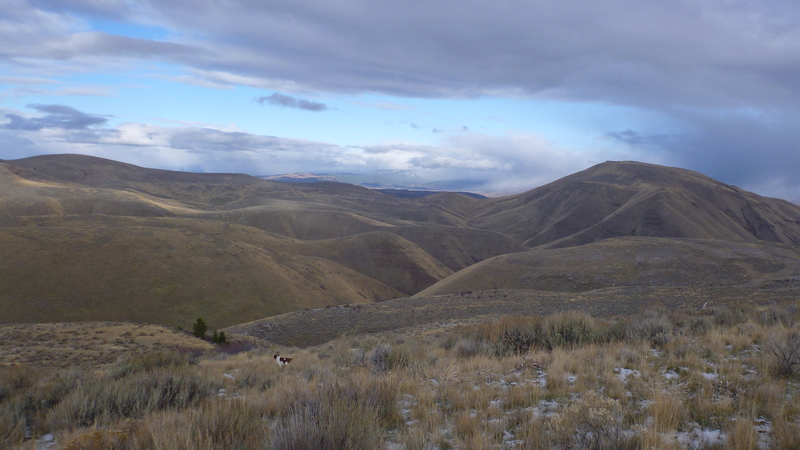 We busted one covey of Huns yesterday, and today I saw two chukars – isolated incidents. I knocked both down. We only recovered one, which doesn’t happen often, but is really hard to take when it does, especially when birds are at such a premium. Angus worked heroically and stoically and I’m starting to worry he’s wondering what the heck is going on. He’s never seen pickings this slim (nor have I). But the terrain and habitat are as good as I’ve seen them, and I’m not giving up even though it’s looking more and more as though the bird numbers are truly way down here. That’s some beautiful looking country. I’ve had more experiences like that this year than I can ever remember. As hard as you hunt you’ll find them. I’ve hunted different spots every time out this year with usually dismal success and than the last two days both places I hunted had fair or better number of birds. Country didn’t look much different than other places I hunted so go figure. Same as other Larry ^. We finally got into them this weekend but it was work, work for chukar hunting that is. You’ll get em.